Following the rip-roaring launch of Sci-Fi in the City last year (reviewed here), its second coming will arrive at Sheffield’s O2 Academy on the first weekend of October 2018 (Earth Time), with a special pre-party on Friday 5th. 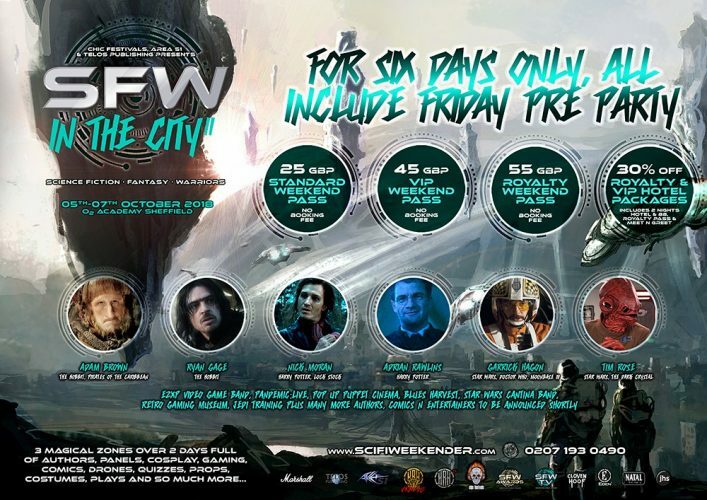 This year it is reborn as SFW in the City II: Sci-Fi Fantasy Warriors! The headlining guests so far include Tim Rose, who is best known for playing Admiral Ackbar (“It’s a Trap!”) in Return of the Jedi. Tim reprised the iconic Admiral in The Force Awakens and The Last Jedi and was also the puppeteer of Sy Snootles and Salacious Crumb in Return of the Jedi. Garrick Hagon, who appeared in Star Wars: A New Hope as Luke’s friend Biggs Darklighter, will be there too. Garrick’s film career includes Tim Burton’s Batman, Richard Attenborough’s A Bridge Too Far, and many others. Also appearing will be Adam Brown, who played the dwarf warrior-scribe Ori in Peter Jackson’s The Hobbit films and starred in Pirates of the Caribbean: Dead Men Tell No Tales as Cremble, who was smarter than the average pirate (something to do with him wearing glasses, apparently). In addition to the stars of film and television, SFW will be showcasing sci-fi, fantasy and comic artists, including Jeff Cummins, whose work you’re probably familiar with from Radio Times as well as many cover illustrations for Doctor Who novelisations. Providing the evening entertainment will be EZXP, a video game-inspired band who take the 8-bit tunes of our childhoods and turn them into rock to have even the most jaded convention goer dancing. These also will be the “cantina band” Blues Harvest that will be blasting the night away with covers from movies and television (as well as a few guilty pleasures). For a more cerebral entertainment, the comedian James Cook (who is not a famous explorer) will be leading Pandemic Live, where four players battle ‘the spirit of disease’ in a live version of the classic board game. Played by guests and audience alike, Pandemic Live is a (funnily enough) a live version of the wildly-popular board game Pandemic. Finally, Saturday evening will play host to a carnival of costumes, music, and dancing, with speciality acts! You can guarantee that nowhere else in Sheffield will offer anything like what will be going down at SFW in the City! So, lock and load, for SFW in the City is coming.